My stash is superabundant and so it seemed right to share it and join the Sew Mama Sew giveaway day! I created a modern bundle of fabrics to giveaway that I think you'll love. There are bright fun prints, low volume and stash blenders. I know you're probably all hopping around so I won't go into too much detail about what is there but the bundle includes a couple of FQs and plenty of scraps - all a useable size (though many have pieces cut out, it is my stash after all!). They are unwashed designer quilting cottons (two are cotton/linen blends). So do you fancy helping me decrease my stash and using these lovelies in your handmade projects? - Leave a comment letting me know your best dance move or what dance you'd love to be able to do. I like to shake my stuff in the kitchen while I'm cooking and cleaning but there probably isn't a word for that dance other than the 'mum dance' even though I think I'm Beyonce ;) I would love to be a fabulous tap dancer like Ann Miller (if you don't know who she is, check this out!). - Followers of my blog get an extra entry, just leave a second comment telling me how you follow (blogger, GFC, a reader, email etc). Please leave your email address in the comment to be sure I can contact you, no reply bloggers have been picked as the winner before and lost out because I can't get in touch with them! No reply bloggers/comments will not win. The giveaway is open internationally and will close on Saturday 13th December, the winner will be chosen by random.org and announced here on that day. Then visit the other great giveaways at Sew Mama Sew! Lol?! I think my groove thing is broken. But if trying to dance, clumsily bumping into something, then watching your furniture fall like dominoes is what you're after then I'm your girl! Plus I'd like to be able to do the splits but the hospital visit that would be needed after is just not in the budget. My (then freshly wedded!) husband and I danced on 'por una cabeza' (you know, from scent of a woman) even though neither of us could/can dance :-) Great and gruesome at the same time :-) wish I could really dance any dance at all! Did my first comment disappear? Rats. I squeed, admitted to dancing the Mum along with you and confessed to harbouring delusions of being in Diversity. *g* Pretty, pretty bundle! I took dancing lessons with my husband years ago as my sister in law is a dancing teacher but I forgot most of it. I wish I could dance Tango, it looks so elegant. Thanks! I also follow you with Bloglovin. Thanks! I grew up in central Wisconsin where everyone kids, teens and grandparents all could polka, love to do a nice Polish Polka again!!!! My favorite dance of all time is the neck work if anyone doesn't know what it is..you hold your head up looking to the right then left keeping your neck stiff and you bounce your head up and down (now that you have that in mind). My cousins and I went out on the town one night and my cousin wanted to learn this dance so bad she kept asking me to show her how to do it so I did. When she finally got it she did it all night none stop. When we woke up the next morning her head was facing to the right and she couldn't move her neck . We were like what's wrong with you she was like my neck hurts so bad from doing the neck work last night..We laughed so hard and she was like that for three days. The four day she had to return home to California with a sore neck but a night to remember for a life time. The one dance I'd love to learn to do is twerk I just don't have the buns back there nor the moves to make that happen but I sure try all the time I keep my kids and grandchildren laughing daily. I love to dance and I love following you on Bloglovin'. I would love to tap dance too! I pretty much like to dance, though I'm not much good at it. Oh! I can totally relate to you. I use to dance while cooking, to lessen the hard task. I'd have loved to be a classic dancer dancer. I know, i know, it's too late now that i'm almost 46......errrr.... is it? Lol! Thanks for the chance! And I follow you via blog lovin'! I would take ANY dance move....considering I have NONE. I wish that I could swing dance! I do the "mum" dance too! I will not lie; I run screaming away from any kind of dance!!! I think the Nutbush done on rollerskates is the height of dancing cool for me. I would love to learn to salsa. Thank you for the giveaway. I'm a happy follower. Thanks for a fun giveaway! I'm dancing in my head now. I totally do the mom dance too, but wish I could do the robot! Any dance moves. I've got none. I did ballet when I was little and have really been wanting to get back into it for a long time... too bad I am neither coordinated or flexible! Thanks for the giveaway! I love to swing dance. I learned in college (east coast swing), and I would love to learn the lindy hop. Ha! I'm not a dancer at all. I wish I was! I do my old disco moves!! Lovely bundle - I reckon I've invented a few 'boss' moves myself - especially to Pharell's Happy! I have two left feet but my mum forced me to ballroom dancing lessons when I was little. Only now can I see that it would be good to have learned to dance properly! We shake it in the kitchen and actually have kitchen dancing parties. My best move (besides the moon walk) is the "raise the roof" - I have fun with it! 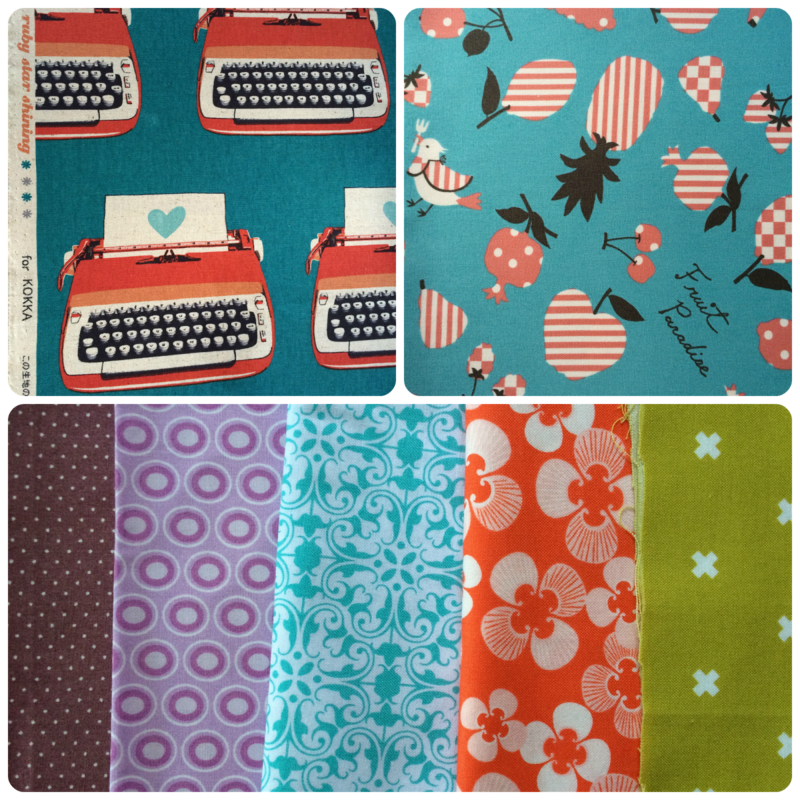 Thanks for sharing your awesome fabric stash on give away day! Happy dancing. I do the "Elaine" and it never fails to amuse my kids. It is the best I can do for dancing! i would love to learn to swing dance. And following you on bloglovin! Love this bundle...and I would love to tap! Ha! I'd love to be able to do any dance move and not look ridiculous but if I had to pick, I think I'd like to learn to salsa! Thanks for a great giveaway! I would loved to be able to ballroom dance-- totally inspired by Dancing with the Stars- lol! I'm pretty clumsy though. Best dance move? Whenever I shake my stuff, my kids just tell me to STOP! I wish I had taken ballet classes as a kid. I'd love to be able to move so gracefully and have such toned muscles. At 53, I'd look reeeeediculous in a tutu! I follow your blog on Bloglovin and enjoy every post! I wish I could dance, I have absolutely no dancing skills! I'd love to learn how to swing dance, but I'm afraid my skills are limited to the running man in my sewing room. I love dancing! I take ballroom lessons every week - waltz, fotxtrot, tango, swing, rumba, chacha, salsa. I don't know that I have a best move but I'm proud of the fact that I'm a really good follower (so when I dance with a really good lead, like my instructor, I can do _anything_). I wish i could ballroom dance.....I have no grace....with a size 11 foot.....hard not to step on toes...lol. Bthanks for a chance to win. I don't get the chance to shake my groove thing like I used to. But I do turn up the music as I'm running my longarm. Does that count? lol, I don`t dance. It`s better for everyone! I will shake it with my kids sometimes, but I don`t know if that qualifies. Thanks for the chance to win some of your beautiful stash! I would like to learn how to waltz. I can't dance... I'd be happy if I could follow the zumba class without getting lost all the time. Thanks! I am hopeless at dancing! I'm an 80 girl we just jump up and down and call that dancing. Lol I took tap lessons a kid but have 2 left feet. I like to headbang like I'm listening to guns n roses. This will never happen but I've always thought it would be fun to 'Swing' or 'Jitterbug' as my mom used to call it. Unfortunately, I have 2 left feet but I can sew much better than I can dance! I like to get low! I wish for weddings so I have more reasons to dance! I'm not a dancer but salsa could be fun. I would love to be able to tap dance around my kitchen! I took dance lessons with my husband (before he was my huband) and we loved to Swing dance. Now, I love dancing around the living room with my toddler. We freestyle it, which for him mostly involves stomping feet. I can do the dance that Beyonce does in the Survivor video. Also, the sprinkler. I really like doing the polka with my husband -- he's a very spirited dancer so it's a good fit! I just wish I had the rhythm to dance at all :) But if I did I'd love to do the tango with my hubby. I have absolutely no dance genes, but do it anyway. I always wanted to be a ballerina. Took ballet as PE in college and was paired with the football player who was required to take the class by his coach. It wasn't pretty. I follow you via Bloglovin (and love your blog!). My daughter and I call my best dance move the shimmy...we like to listen to music and dance in the kitchen while cooking! I don't have any good dance moves, but would love to learn salsa! Thanks for the chance to win! I can do the chicken! I like that "Stayin' Alive" disco move where you point your finger up in the air and swing your hip out and then point down at the floor and swing your hip the other way. LOL! I'm not a dancer! My moves have no name! Any dance move would be great... not my strong point. Thanks for the great giveaway! I cannot dance. I do believe I could successfully square dance. I danced in high school but would love to take ballroom dance classes. Chciken Dance - I am a pro at weddings with it!!! I am a follower through GFC. WONDERFUL giveaway! I dance a lot when I'm at home, but I'm sure there isn't a name for this kind of dance :) Let's call it Random Dance. I have always wanted to know how to waltz! I'm pretty great at Zumba! I am a new follower with bloglovin! I am a terrible dancer so I'd really just like to be able to dance in general! I wish I could waltz! Running man? That's all I got. Haha. Thanks! Mine is the Carlton from the Fresh Price of Belair! My husband and I took swing dancing lessons when we were engaged -- SO much fun!! You're a doll for including those typewriters. I love them!! I can't dance, so I will say the Chicken Dance! I LOVE scraps! I have no rhythm, but I think ballroom dancing would be fun. It would be lovely to be able to do a Viennese Waltz! Dance moves? Oh goodness, that is something you don't want to see!!!! I am actually a decent tap dancer! I follow you on bloglovin (though I'm a bad blog friend lately... IG has stolen my heart!) and also on Instagram. I can't claim to have a move but I'd love to learn more ballet. Thanks and happy holidays. I follow you via Blovlogin. I'm not much of a dancer, but I did try to learn how to line dance - not very successfully. I dance while cleaning, ironing, cooking, but I wouldn't call myself a great dancer. I used to dance a lot of salsa when the DH and I were newlyweds. Thanks for the chance! I don't dance :p and you wouldn't want to see me dance! I would love to learn to Salsa! I really like Zumba, it's like dancing but the point is fitness and I don't have to choreograph anything myself. I used to be able to Waltz and Fox Trot but from lack of practice I've forgotten. I would love to learn again. I wish I could salsa! Arthritis wreaked havoc on my knees so all I can do these days is a finger dance. I wish I could ballroom dance... but I do the Sprinkler pretty well! I enjoy the "dance like no one is watching" type of dancing... when there is really no one watching LOL! I'm all about the "Mum Dance" - I love to shake it while I'm cleaning, but don't have any official "moves". Are you really prepared to send all that fabric all the way to Australia to ME!? I did some Salsa lessons a few years ago- I wish I could do it better! But any dancing makes me happy! I am an old fashioned Blogger dashboard follower! I can sprinkler with the best of them! Oh goodness, I am the worst dancer ever! I have been forbidden to dance by friends to dance lol! That would have to be the Happy Dance. You know where you start screaming and jumping up and down like a crazy lady. It's when you receive a nice squishy package in the mail and you can wrap this up and put it under the tree and tell your spouse you just won fabric and he didn't have to but this one himself. Thank you for being a part of the Sew Mama Sew Giveaway and giving me the chance to win this lovely package of modern fabric. Merry Christmas to you. I used to tap dance pretty well, but those days are quite behind me! Thanks for this bundle, it looks great! Whichever way I dance, my boys find it embarrassing, but I do swing my hips when a catchy tune is played! My best dance move? It's hilarious just thinking about that! I'd love to be able to do proper ballroom dancing so I could dance at weddings without looking silly. All I know is my husband just shakes his head whenever I start dancing around so I would say those dance lessons as a child did not pay off. I can't dance a whit, but I wish I could do ballet, or ice skating (does that count as dancing?) THanks for the great giveaway! I love love love all these fabrics! I follow you on Bloglovin'! Thanks! All the dancing I do these days is with my toddler grandchildren!